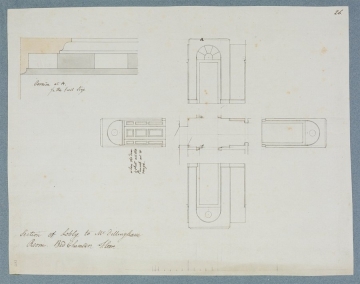 51 Record copy of plan and laid-out wall elevations inscribed Section of Lobby to Mr Dillingham['s] / Room, Bed Chamber Floor and detail of Cornice at A. Drawing 51 is the same as drawing 54 where it is labelled 'Lobby to Mrs Dillinghams Dressing Room'. The chimney-piece has panel pilasters with bell-flower drops on the jambs and a fluted frieze. Drawings 52 and 53 show the same design. 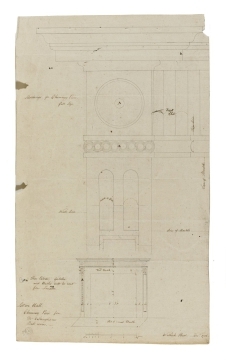 Though the latter is inscribed by Soane the nicely finished drawing is probably not by by him. See also drawing 57 for a related drawing made for the fabricator of composition mouldings.